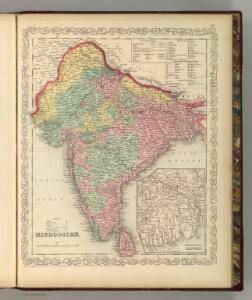 India (Northern Part). India (Southern Part). 1 : 9250000 Tanner, Henry S.
1 : 12400000 Schonberg & Co.
1 : 9100000 Tanner, Henry S.
Hindustan, with Part of Caubul. 1 : 15000000 Tanner, Henry S.
1 : 10000000 Lavoisne, M.